Here is my newest recycled plastic bag tote. 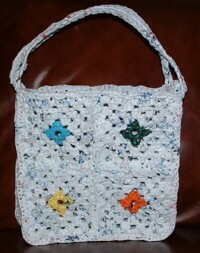 It is crocheted using 4 colorful bags for the center granny square motifs. If you have lots of white plastic bags, this is an excellent way to use them up and still make an attractive and stylish tote bag. You only need 4 solid colored bags to crochet this plarn project along with about 30 white plastic bags. This granny square tote features two longer straps so the bag can be carried over the shoulder. The 4 inch depth makes it handy for carrying books, your lunch, or anything else that you might like to use this cute tote for. As always, please enjoy my free crochet pattern and happy green crafting to all!